One of the largest decisions made by the City Council during the "Decade of Progress" was the closing of the walk-streets. Some 4,700 signatures had been collected in a three-week campaign to keep Manhattan Beach walk-streets closed to vehicular traffic. It was the desire of the residents to maintain the unique personality of the neighborhoods. In 1962, an ordinance was endorsed by the Council, even though the City Attorney felt the ordinance was worthless. The walk-streets were to stay closed permanently. Another decision made in 1962 was the renewal of the Manhattan Beach International Paddleboard Race, which had been abandon in 1961. It had been held annually, since 1955, with one exception; in 1959, when its finish line, the City Pier, was undergoing repairs; and in 1961, due to rough seas, which made holding the race unsafe. The events thrilled thousands of residents and visitors alike, bringing media attention to Manhattan Beach. By the year 1966, the City was primarily residential, with a population of 36,078 a 6.3% change from 1960, with a median income of $8,289 and median age of 29. The dynamic capital improvement programs truly were a testimony to its "Decade of Progress." Nearly every phase of Manhattan Beach’s operations had been vastly upgraded and groundwork had been laid for more spectacular improvements in the years to come. Capital developments during the past decade had been achieved without resorting to bonded indebtedness. In 1967, there were many specialty projects: more and more property owners requested lot splits, gas lighting assessment districts were requested, one being at 31st street between Bell and Laurel Avenues, and the lettering, "Manhattan Beach Welcomes You" was planted in violets in the City Hall front lawn with annuals planted to replace ice plant around the north parking lot. Another project was the drilling of four new injection wells located in the Santa Fe Railway right-of-way between Elm Avenue and Florury Road along Valley Drive. Saltwater intrusion had been a major problem in the South Bay area for two decades. The original effort to prevent contamination of the fresh water aquifers had been designated the "Manhattan Beach Experimental Project." The construction was a portion of the overall improvement in the Ground Water Replenishment District project of the West Basin. One of the largest joint projects between El Segundo and Manhattan Beach was the improvement of Rosecrans Avenue. The first section to be improved was between Sepulveda Blvd. and Aviation Blvd. In October of 67', the water division worked at relocating meters and fire hydrants for the purpose of putting in new curbs. The roadway also had to be closed to lay the multitude of pipelines, mostly oil lines, which crossed Rosecrans at two points from El Segundo. Work by the contractor had been suspended for approximately five months under conditions of the contract with the Los Angeles County Road Department, which provided for this period of suspended activity to allow Standard Oil Company to construct and relocate their underground oil and petroleum products transmission pipelines. After the completion of Rosecrans east of Sepulveda Blvd, it was time for Rosecrans Avenue West of Sepulveda to Highland Avenue to be redesigned. 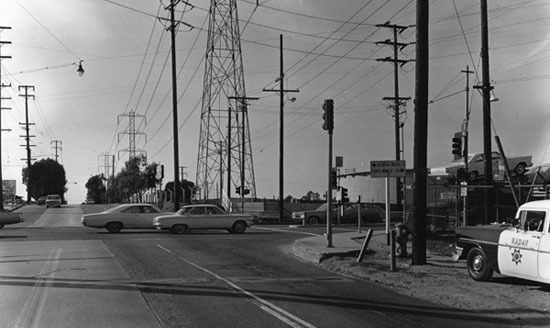 In April of 1968, with the cooperation of Standard Oil, the Edison Company's high-tension power lines were relocated North of the original location. By 1969, the majestic rows of eucalyptus trees were removed, never to be replaced.